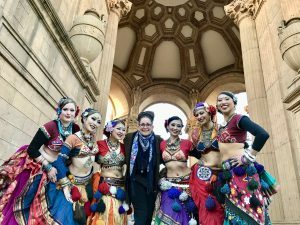 Join Carolena and FatChanceBellyDance® for General Skills in the San Francisco Bay Area, the birthplace of American Tribal Style®! The General Skills course will be held at the Four Points by Sheraton San Francisco Bay Bridge hotel in Emeryville, California. The venue is conveniently located just across the Bay from San Francisco and is accessible from both the Oakland and San Francisco International Airports by public transportation. Hotel accommodations are NOT included with registration fees, but discounted rates will be available. Please stay tuned for more information about hotel reservations, amenities, and exciting event information! Registration will be online only through Eventbrite starting January 18, 2019 at 12pm PST. Pay in full to secure your spot. Space is very limited!